No. 1 doctor recommended brand (Among stool softener ingredients). Trusted for guaranteed relief. 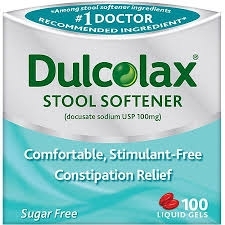 Dulcolax Stool Softener contains the no. 1 doctor recommended stool softening ingredient. It works gently by drawing water into the stool in order to prevent dry hard stools and make passage more comfortable. Many people find two liquid gels an effective starting dosage and then one liquid gel for maintenance. Adults and Children 12 Years and Over: Take 1 to 3 liquid gels daily. Children 2 to Under 12 Years: Take 1 liquid gel daily. Children Under 2 Years: Ask a doctor. Store at 15-30 degrees C (59-86 degrees F). Protect from excessive moisture.